The World’s Slimmest Smartphone Gets a KitKat Upgrade! 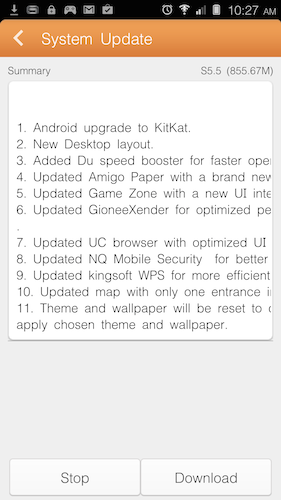 I’ve read a couple of posts regarding the release of the Android 4.4 KitKat upgrade for the Gionee Elife S5.5. After days of waiting, I finally got a notification today that the upgrade is already available! Yahoo!!! According to the Summary, it seems they’ve made quite a number of changes to the World’s Slimmest Smartphone. You can check the image found above. The file is around 400MB+ so it will take a while to download it. I’ll write another blog post regarding the improvements on the Elife S5.5 after updating it. If you own a Gionee Elife S5.5, download the Android 4.4 KitKat upgrade now!